Will antibiotic-resistant "superbugs" be a bigger killer than cancer? 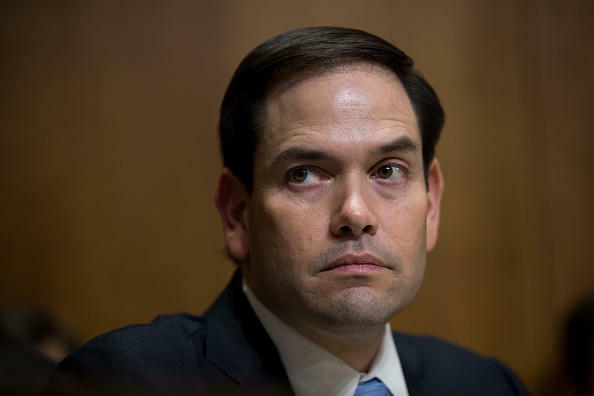 Sen. Marco Rubio said Tuesday that the recovery effort in Puerto Rico after Hurricane Maria requires a "more aggressive" response from the federal government. "We need to lean into this a lot more than we traditionally would because Puerto Rico's government says their own capacity has been tested by two storms and a fiscal crisis," the Florida Republican said at a press conference on Capitol Hill after meeting with Vice President Mike Pence and other officials at the White House about the situation. Rubio, who visited Puerto Rico on Monday, said it's clear from the Trump administration's announcement Tuesday that the federal government is ramping up and increasing the intensity in the response. The president, who will visit the island next Tuesday, amended the Puerto Rico disaster declaration to make additional federal funding available. Normally, Rubio said that the federal government responds to a storm by plugging into the existing response of a state and it works from that structure to distribute aid. Rubio, however, said that model won't work in this case because Puerto Rico has been stricken by two natural disasters, faces significant fiscal and financial constraints and because of the sheer scope of the damage. The senator said that the island has experienced a 100 percent power outage, a 100 percent communications outage and significant infrastructure damage. There are "still a lot of challenges," Rubio said, such as the inability to drive restoration trucks on the island. Instead, he said that aid must be shipped there by either barge or plane. Rubio said, for example, that a barge is leaving for Puerto Rico Wednesday and won't arrive for five to six days. Rubio warned that if aid doesn't get to Puerto Rico fast enough, "This could rapidly escalate," alluding to the nursing home patients who died in Florida following Hurricane Irma earlier this month. © 2017 CBS Interactive Inc. All Rights Reserved. Rebecca Shabad is a video reporter for CBS News Digital. Part of the three-year agreement between the supermarket and its workers includes "increased pay for all associates"
Cummings: Trump will be "emboldened" if Democrats "do nothing"
Pete Buttigieg on the presidency as a "moral office"
Were intel warnings "ignored" ahead of Sri Lanka terror attack? Police chief issued an intelligence alert more than a week before deadly bombings about possible suicide attacks on "prominent churches"
At least 290 people killed and more than 500 wounded in blasts in and around Sri Lanka's capital, and warnings may have been "ignored"
Florence Welch on her own "Hunger"
As Florence Welch – lead singer of Florence + the Machine – faced down her demons, her lyrics became more revealing. Anthony Mason talks with the 32-year-old about her music. Harper Lee's Pulitzer Prize-winning novel about racism in the Deep South has been a perennial read in grade school, an Academy Award-winning film, and now a critically-lauded play on Broadway. Tracy Smith talks with the show's star Jeff Daniels and playwright Aaron Sorkin about translating Lee's characters to the stage, and with students who talk about "Mockingbird"'s relevance to today's audience. Following a series of bombings in Sri Lanka on Easter Sunday, the government blocked apps like Facebook and WhatsApp to stem the spread of misinformation. Jennifer Grygiel, an assistant professor of communications at Syracuse University, joins CBSN's David Begnaud to discuss the government's decision. A federal agency says debt-collection regulations need to be updated to reflect new technology like smartphones. Apps are being used for everything from tracking your diet to your daily steps and even your pregnancy. But that health-related data might not be as safe as you expect. Recent research published in BMJ, the British Medical Journal, found 79 percent of the top medication-related mobile apps shared user data in ways that may compromise sensitive information. Wired senior writer Issie Lapowsky joins "CBS This Morning" to discuss the latest research. If my measles shot was years ago, am I still protected? Led by tech giants like Google and Apple, companies are pouring resources into clean energy -- and changing the market. Sunday marks the sixth straight day of peaceful demonstrations since an officer-involved shooting near the Yale campus Tuesday. The surveillance video appears to show the moment police engaged with a car they said fit the description of one linked to a reported armed robbery. Hamden Police Officer Devin Eaton jumped out of his SUV, gun drawn, firing multiple rounds into the car. Mola Lenghi reports. Man arrested after 2 kids shot in apparent road rage incident in N.C.
More than 200 people are dead after a group of religious extremists set off eight bombs in churches and hotels across Sri Lanka on Sunday. The attack comes less than a month before Sri Lanka will mark 10 years since the end of the decades-long civil war. Faraz Shauketaly, a TV broadcaster at News First and an editor at The Ceylon Independent, joins CBSN's David Begnaud to discuss the political climate in Sri Lanka. An Antares rocket blasted off from the Wallops Island Flight Facility in Virginia carrying a Cygnus cargo ship loaded with supplies for the International Space Station. Retired astronaut Scott Kelly, who spent 340 days in space during an extended stay aboard the International Space Station in 2015-16, did not suffer any major long-term health effects that might raise warning signs for future long-duration flights, scientists reported Thursday. CBS News space consultant Bill Harwood joins CBSN with details. CBS News space consultant Bill Harwood speaks to CBSN about the failed moon landing and Thursday's other headlines: SpaceX's second launch of their Falcon Heavy rocket and NASA's report that astronaut Scott Kelly experienced biological changes during his year-long orbit in space. There was no way he could have known a trip to the dump would change his life -- and those of hundreds of dogs. For years, archaeologists have wondered how the mysterious statues came to dot the island in the Pacific. Now, they're trying to find a way to keep the statues around. Anderson Cooper reports. In this installment of CBSN Originals’ ongoing examination at how migration is reshaping the world, Adam Yamaguchi travels to Sweden to examine how a record influx of migrants has coincided with the recently welcoming and politically progressive nation's swift shift to the right. Copyright © 2019 CBS Interactive Inc. All rights reserved.